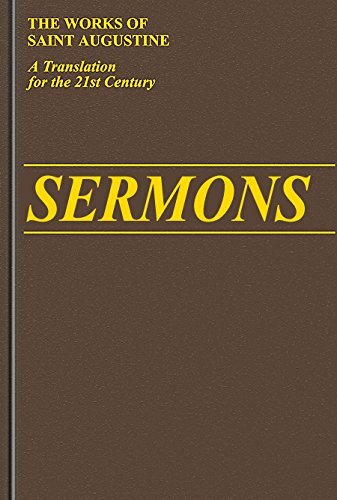 Synopsis: The Complete Works for the First Time in an English Translation for the 21st Century 50 volumes in the complete set - 2 volumes published per year. Augustine of Hippo (13 November 354 - 28 August 430), also known as Saint Augustine or Saint Austin, was an early Christian theologian and philosopher whose writings were very influential in the development of Western Christianity and Western philosophy. He was bishop of Hippo Regius (present-day Annaba, Algeria) located in the Roman province of Africa. Writing during the Patristic Era, he is viewed as one of the most important Church Fathers in the Western Christianity. Among his most important works are City of God and Confessions, which continue to be read widely today. Review&colon; "If the high standard set in the volumes which have appeared so far is maintained, this collection will become the definitive one for all English-speaking students and scholars... I am already grateful that I can recommend the excellent edition of The Trinity to my students with its detailed introduction, extensive critical notes, scriptural and general indexes and, above all, its fine translation which makes Augustine's arguments even more accessible by the introduction of chapter divisions and synopses. It supersedes all other English editions in every respect." Dr Carol Harrison, Dept of Theology, University of Durham. Edition: Edmund Hill O.P. (translator). Augustine, St.; Edmund Hill trans. ; John E. Rotelle ed.